Several clubs throughout our District stage regular charity movie nights and all are very successful. Apart from the obvious fund raising benefit, such nights involve members of the public and provide the perfect public relations exercise for contact with potential new members. So, please take time to study Rob Byrne’s excellent guidelines, then make arrangements for a meeting with your local movie cinema manager. We recommend clubs in one suburb/city combine forces for the evening and make this a combined event. Be sure to take Rob’s notes with you to the cinema meeting and share with the manager. Such action makes it very clear that Rotary has the full support of Fox Studios with this annual promotion. I also suggest you print your own copies of the poster to share with Rotary club members – or circulate on line via your club bulletin once the event is arranged. You will need to negotiate your special price with the cinema manager but please remember this is voluntary community service on his/her part and they are under no obligation. We need to build relationships with cinema people in the best possible way. Some clubs serve finger food and beverages to add to the social occasion but such arrangements need to be made with the cinema manager. Lower Blue Mountains Rotary has a great success story with charity movie nights and if anyone was further discussion, don’t hesitate to contact me directly. As you would know, this year’s Polio Movie Event is looking like the biggest and best ever. Bohemian Rhapsody, the story of Queen and Freddie Mercury, is something that we can all relate to, no matter what our age. Check out the trailer at www.bit.ly/BohRhapTrailer -- it will rock you! the cinema is likely to regard the Rotary event as great word-of-mouth promotion for the movie. 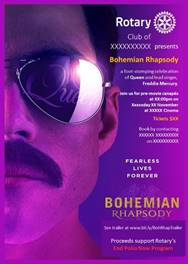 the club may want to consider making it more than just a movie event, by including other activities, such as dinner or canapés, raffles, prizes for best-dressed (Freddie-style?! ), etc. 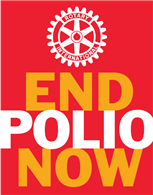 Please let clubs know that, to maintain consistency, the event is only to be used to fundraise for End Polio Now. I’ve also attached a PowerPoint that you may wish to use to create an ad for your district bulletin, Facebook, etc. Feel free to edit. * Unfortunately, PowerPoint leaves a large margin around the printed area of a slide. If the club would like to reduce the size of this white border, they just need to increase the flyer’s printed size. In PowerPoint, select Print > Printer Options > Effects tab > Percentage of Actual Size and use about 110% (varies by printer).